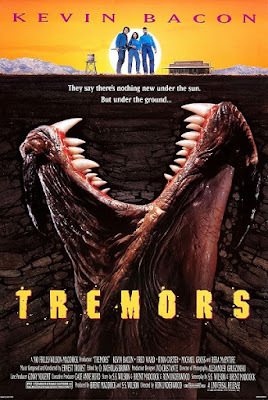 Chris, Corinne, Sarah, and Tim dig beneath the surface of the 1990 creature feature Tremors. Subjects discussed include the metaphorical significance of the town of Perfection, the film's seamless puppet and model effects, and the great human need for further adventures with Val and Earl. Warning: Contains explicit language, spoilers, and bad TV-version overdubbing. Want to share your pole-vaulting technique? Care to advise us on the best high-powered rifle for subterranean monster defense? Have your own graboid origin theory? Leave a comment below and keep the discussion going.